In the educational and entertaining “Pie Skills” video series, Red Tractor Pizza owner Adam Paccione offers quick kitchen tips for pizza lovers, aspiring chefs, and anyone wanting to feel more comfortable in the kitchen. 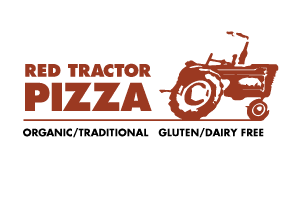 Topics range from safe knife handling and prep work, to brick-oven cooking methods, to learning how to make and toss your own pizza dough. In episode no. 1, Adam (playing Pepperoni Paccione) goes over the different parts of a chef’s knife, and demonstrates the proper, safe way to hold it. Watch the full video and meet Paccione for yourself by clicking here. There are plenty of knives that you can use in the kitchen, but today we are going to be learning about a chef’s knife. For most western cooks, a chef’s knife is the “go-to” knife when preparing food. Pie Skills, Episode no. 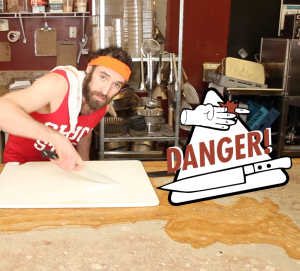 1: Pepperoni Paccione explains proper form for chef knife handling. To hold a chef’s knife properly, take your thumb and forefinger, and wrap them around the bolster. Then g take your remaining three fingers and wrap them around the handle. Squeeze tightly, and firmly press the knife’s tip against the cutting board. This will stabilize the knife and prevent it from moving around so that your little fingertips don’t get sliced off.